ROCHESTER, NY (WXXI) – State Police say a trooper who stopped to help a driver with a flat tire near Elmira over the weekend found out the call was anything but routine. Photo courtesy of New York State Police. 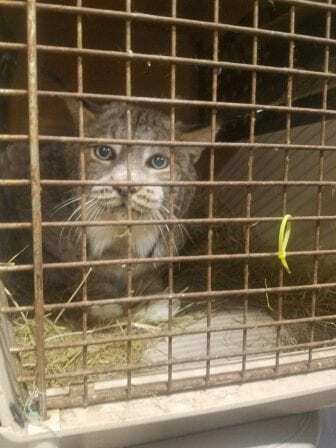 When police were helping a driver on I-86 in the Town of Ashland on Saturday in Chemung County, the trooper noticed a dog cage in the pack of the pickup truck and in it, they discovered a Canadian Lynx. Police say with the help of the NYS Department of Environmental Conservation, they found that the people in the truck were illegally transporting the Lynx from Illinois to Binghamton. The pickup truck driver was charged with the transport and possession of threatened wildlife without a permit. The Lynx was turned over to DEC.